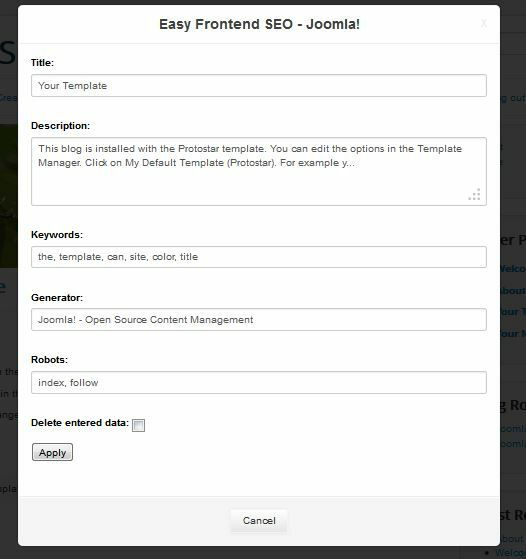 Easy Frontend SEO is a very nice extension from Kubrik extensions. They also have some excellent other extensions, like the SIGE Gallery, a Guestbook (Easybook Reloaded), plus another little SEO plugin for optimizing links and images (SEOFLI). The extension is made to very easily manage your meta-data. You can do so from the front-end of the page you are actually looking at, so no need to doubt whether you should create meta-data for an article, or the menu-item, or even somewhere else. Based on the default parameters, this tells us that there is a title, no meta-description, no meta-keywords, and there is a robots tag and a generator tag (mouse-over tells you what is what, configurable). So if you click one of the red crosses, it allows you to set your meta-data. In an unconfigured site, they will be empty, so just fill them in as desired. The default settings also stop you from entering more then the advised number of characters for meta-tile (60) and metadescription (160). Also this can be overwritten in the configuration. Though not perfect, it does a rather good job, and at least something has been filled in. As a first step you could activate this feature, and then go over the separate articles to fine-tune the meta-data. 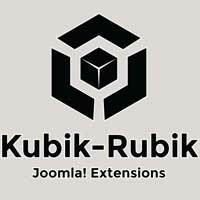 The extension is available for free for both Joomla 2.5 and 3, though a donation for the developer would be nice.